No farewell bump for THE ORIGINALS. CW: The series finale of THE ORIGINALS held at 0.3. It was preceded by a steady 0.2 for BURDEN OF TRUTH. CBS: BIG BROTHER stayed at 1.5, followed by reruns at 0.4/0.5. 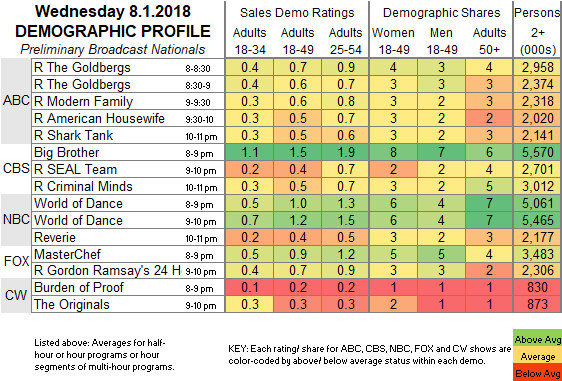 NBC: WORLD OF DANCE gained 0.1 to 1.1, and REVERIE remained at 0.4. 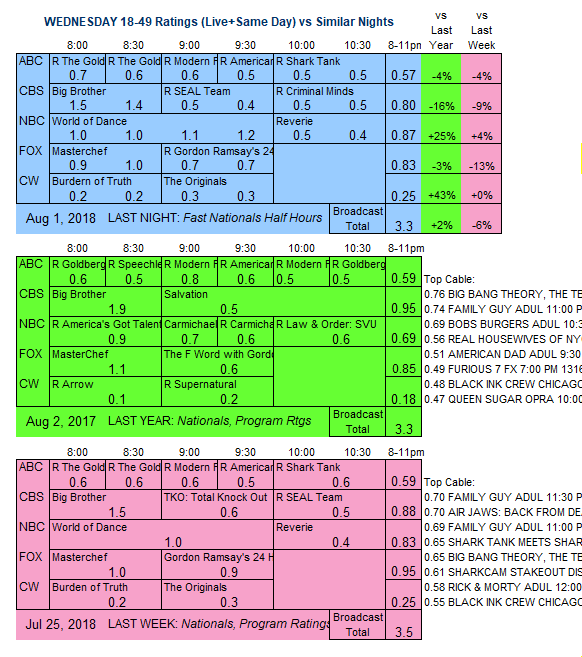 FOX: MASTERCHEF dropped 0.1 to 0.9, followed by a rerun of 24 HOURS TO HELL & BACK at 0.7. ABC: A night of reruns at 0.5-0.7. Pro football returns to the airwaves with tonight’s NFL HALL OF FAME GAME on NBC. On cable, Freeform has the season finale of CLOAK & DAGGER, followed by an unusual airing of the first episode of Hulu’s Marvel series RUNAWAYS.